mirrorshades.gs: Krylon Fusion for Plastic in Australia! So, if you're into nano reef aquariums you may be familiar with the need to paint the rear of your tank black (or blue if that's your thing) to hide your filtration equipment and to make the tank look sharper. 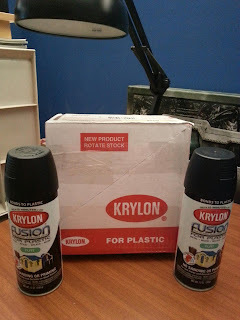 Now, if you're like me and are Australian and also happen to live in a regional area then you may find it difficult to find the paint of choice for most of the community: Krylon Fusion for Plastic. It seems that it's the go-to paint for the American enthusiast and as such you run into flat recommendations of "Wal-Mart carries it", which doesn't really help you. As soon as I get them into my hot little hands two of my work-in-progress tanks will have nice and black backs which will let me get on with the rest of setting them up.